Hello Friends! Well, you shouldn't be surprised to see these, so let's just get right to it! I posted two of the goodie bags HERE. And then I received an e-mail request for 12 of them! 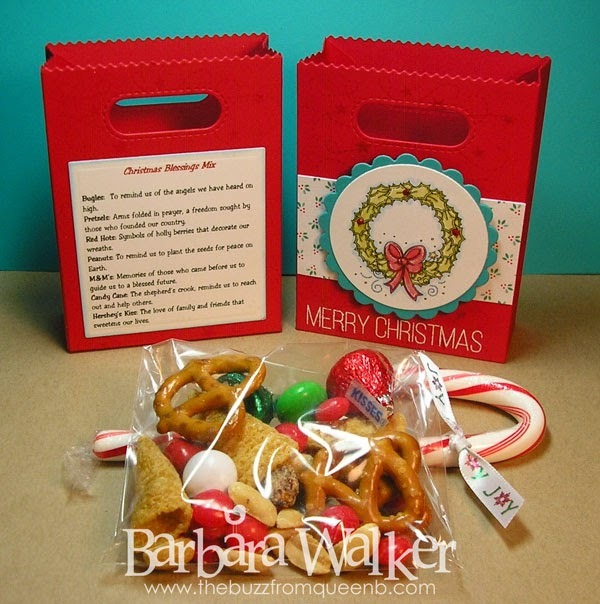 They are to be used as table favors for a Christmas Bunco. I was ALLLLL over that! I got busy right away and did a quick Google search for a Christmas Blessings mix and then it was game on! 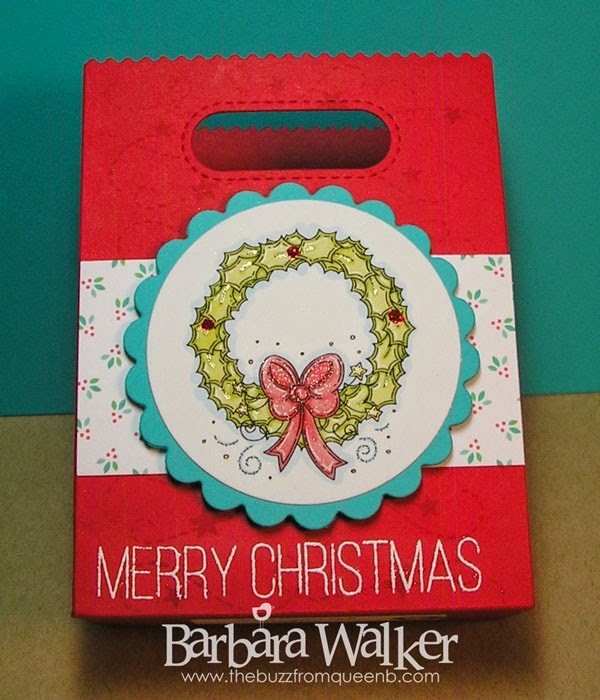 Again, using the Lawn Fawn Goodie Bag die, made quick work of cutting my bag shape. I set everything up and just went at it assembly line style. I did the same steps for these as I did on the previous bags. But with these, I added the Christmas Blessings Mix poem onto the back. I came up with two versions. There are several out there online, but these two fit my needs. Bugles: Bring us the joyful message of the Heavenly Host, announcing peace on earth, good will to men. Pretzels: Symbol of a mother’s loving arms. Mary wrapped her Son in swaddling clothes and laid Him in the manger. Red Hots: Red berries that decorate the holly plant, a reminder of eternal life and Christ’s redemption. Peanuts: The promise of a future harvest, one we will reap only if seeds are planted and tended with diligence. Dried Fruit: Reminds us of the rich gifts brought by the Wise Men. M&M’s: Memories of those who came before us to guide us to a blessed future . Candy Cane: The shepherd's crook brings back sheep strayed from the fold. It reminds us to reach out and help others. Hershey’s Kiss: The love of family and friends that sweetens our lives. Bugles: To remind us of the angels we have heard on high. Pretzels: Arms folded in prayer, a freedom sought by those who founded our country. Red Hots: Symbols of holly berries that decorate our wreaths. Peanuts: To remind us to plant the seeds for peace on Earth. M&M’s: Memories of those who came before us to lead us into a blessed future. Candy Cane: The shepherd’s crook, reminds us to reach out and help others. Hershey’s Kiss: The love of family and friends that sweetens our lives. I added a bit of sparkle and shine with a clear Wink of Stella glitter brush pen on the bow, a clear Stardust pen on the wreath and Xmas Red Stickles to create the "berries". Although, very faint here, you can get a glimpse of the tone on tone background stamping I did with Versamark ink. This creates interest without taking attention from the main image. And that is all I have to share with you today. I still can't believe it's December already! But, ready or not, here comes CHRISTMAS!! 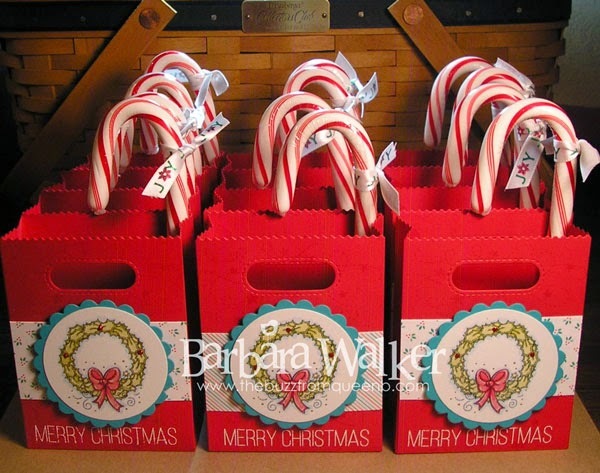 Your goodie bags are glorious, Barb. They're so festive and fun!